When I first drew these designs, five or six years ago, I didn't have a daughter, much less a lot of Princess paraphenalia hanging around for inspiration. But this time, as I was sorting through these designs and printing them all out to study their colors in preparation for their re-release by Windham Fabrics, and hanging them up on my studio wall, I had an actual Princess castle, almost three feet tall and just as wide, right behind me the whole time. Then, I remembered that Liesl had made a beautiful little Bubble Dress from one of these prints, also before I had a daughter, and that now, just in time, after hanging in her closet since before she was born, it fits. My princess-freindly household is also currently consumed with the idea of sleepovers, big girl beds, making friends, and playdates (which we are getting very good at, in a two-almost-three sort of way), and also, unfortunately, in resisting naps and bedtimes with the ardour of a certain royal and her obnoxious pea. 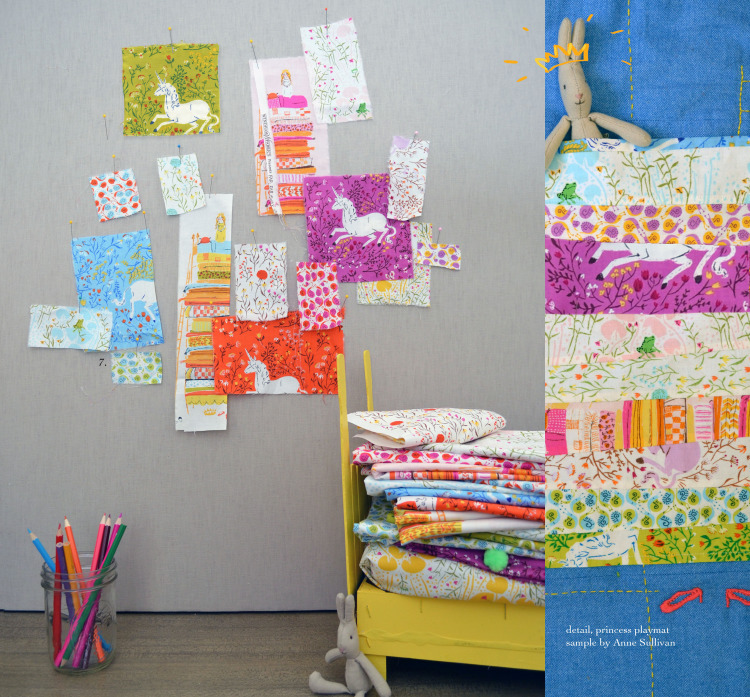 We were thus inspired to create both a piece of original artwork and a "quilted play (nap?) mat" project for this fabric collection, and are offering them all together in a special "Far Far Away Collectors Pack". Thanks, btw, to my dear freind Anne Sullivan for translating my drawing into a quilt. She's such a pro. 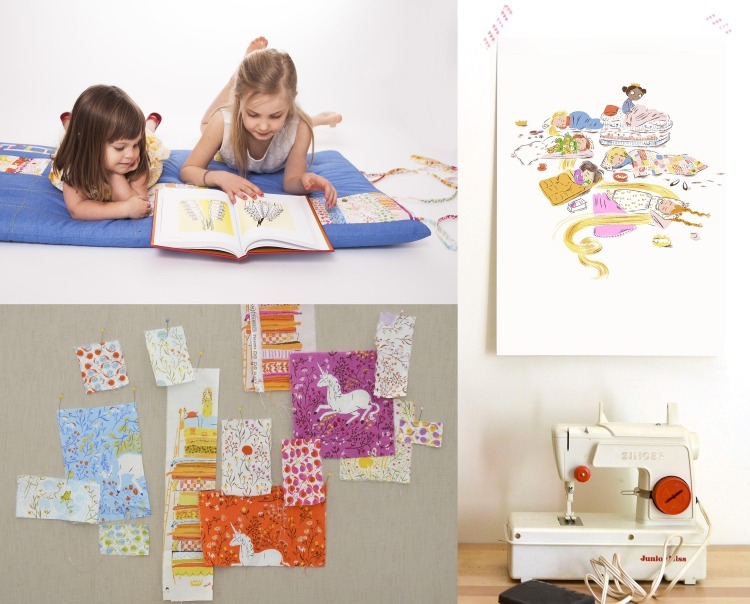 Each Collectors Pack includes a half yard of each print (16 in all), a signed print of "Princess Sleepover" (pictured in detail below), and a pattern for this adorable, cozy little mat. The quilted mat project takes only about a fat quarter of each print, which means you'll have another fat quarter left over for other projects or that stash of yours. The package price is $90. We are offering these only on a pre-order basis, since we must pre-order them from our manufacturer. If you'd like one (or two) for yourself, please reserve yours right here. We are asking for a small non-refundable deposit ($20). These will ship in July, at about the same time that the line begins to appear in shops. We'll send you an invoice when it's ready to ship. We are always looking for a way to offer international shipping, but cannot do so at this time. I know, it's unfair. I agree. But the extra work involved in shipping internationally from our remote summer locale is prohibitive, and the high shipping rates often create issues post-sale. We will, however, always try to ship to US military familes worldwide, even if it's means a lost day or two on our end. It's the least we can do. If you have questions about this or anything else, please don't hesitate to email us. the gorgeous photos of Bee and her freind Daisy, by the way, are by the very talented Patricia L Brown. and here's the quilted play mat. And that daughter of mine. Oh, did I mention that the playmat has long ties so that it can be folded and secured for easy storing (or using as a comfy little seat), and that at the end of one of those ties, there is a pea? Its a green pom pom, but you get the idea. Place an order for a Far Far Away Collectors Pack here. 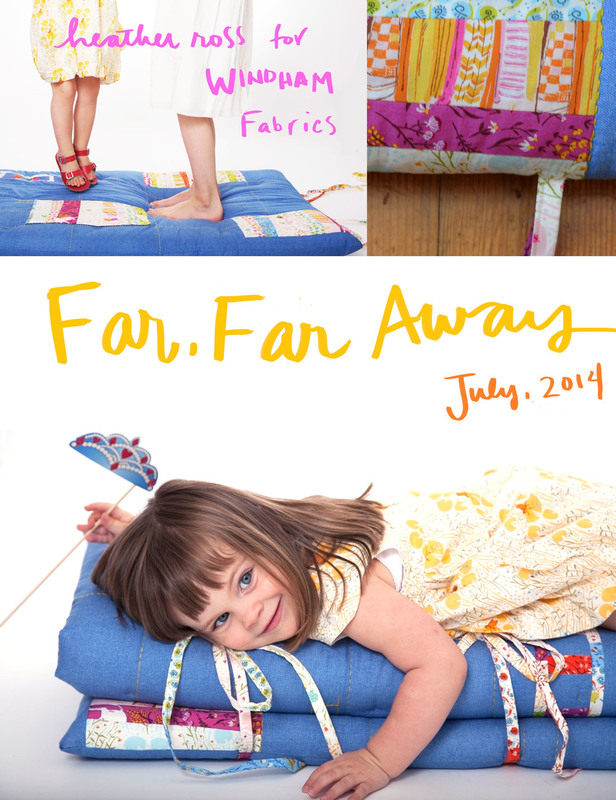 View the entire Far Far Away Catalog over here. Email us your questions, as always, over here. a drawing I did of Denyse and her design wallSo much about this summer's workshop schedule feels like a homecoming, in my mind. I'm hosting two one-day workshops on my very own rooftop (where Denyse Schmidt will be making a guest star appearance!) following a whole lot of travel in May, and then I'll be heading up to Bridgeport CT to help Denyse with one of her brand new weekend long Advanced Improv Workshops. When I first moved back to the east coast and was struggling to find my footing and adjust to muggy summers again, Denyse invited me up to Fairfield on weekends, which is just an hour away by subway and train. Denyse is what my grandmother would have called a Great Yankee Hostess. I would always arrive to find beautifully packed picnic lunches, starring bacon sandwiches, which we would put into a sturdy tote and carrry to the beach on a pair of heavy vintage bikes. In the evenings we played Scrabble and drank beer on her porch as the sun set. Denyse always has a solid plan with plenty of art, outdoors, and good food, regardless the season. That was the thing that I remembered quickly about living in places with four seasons: that each of those seasons moves quickly, and must be savored. Regardless of season, my favorite place to be with Denyse was and still is in her studio, in the hardscrabble town of Bridgeport, which is a place so like so many of the small towns in the Northeast whose boom years have come and gone, leaving behind the tall sturdy buildings made of stone and brick and wood with their huge windows to let in the sunlight. Denyse's studio is in on the fourth floor of one of these buildings, and the windows are so big and the light so beautiful in her workspace that it's no wonder the colors in her fabrics and quilte feel so pure and true. Like so many people, her studio is also where I took her amazing one day improv workshop. She has been hinting about developing an Advanced Improv Weekend for a while, to show off the best bits of her hometown (and her real life), and this summer it's finally happening. It sounds, in my opinion, too good to be true. I'm also looking forward to our (sold out) Blueberry Hill Inn workshop in June. We missed being there during our hiatus and can't wait to pull in and see our big scissors flag flying. In case you don't know, it's tradition for an English Inn to fly the home counry flag for it's guests. When TC and I got married at Blueberry Hill in 2007 we had friends who came all the way from London, Ireland, and New Zealand. It took them days, literally, to get there, and when they came to the clearing at top of the mountain where the little Inn sits and saw their respective flags flying they were beyond touched. It occurred to us after six years of workshops there that we needed our own flag, so we made the one above. That was during our last visit so this summer will be it's innaugual hoist, and the first time I'll see it waving through the trees when I come up the gravel road. 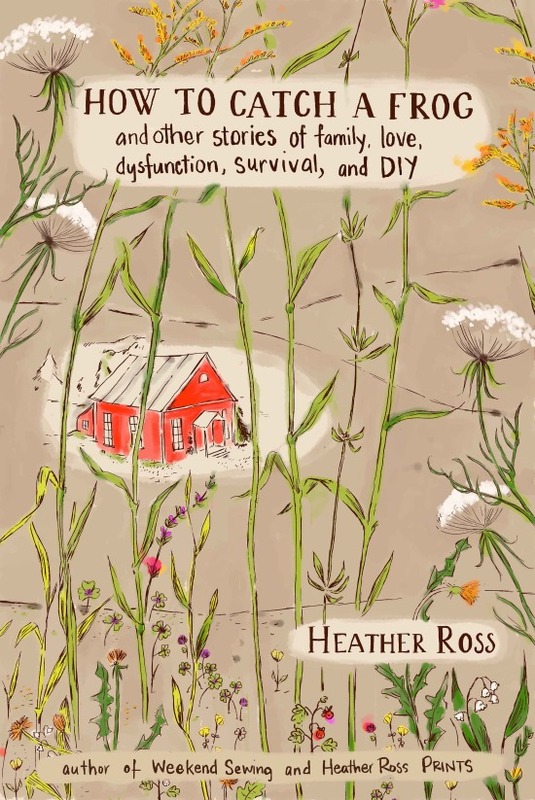 I'm so pleased to finally be able to tell you about this book, which will be out in the fall of 2014. I dont think it's a coincidence that picture book illustrators often have a lot in common with the characters they help create. I'm not sure if art is imitating life or the other way around, but it happens a lot. How To Behave at a Tea Party is the first of a series about a little girl named Julia, who at first I failed to see myself in at all. But then I told my neice Mattie (who was maybe thirteen at the time) about Julia. "She wants to throw a tea party, and have it all go perfectly and beautifully, but she ends up getting really upset because she's got ssome control issues and things don't go as planned." And she said "Like you at your wedding?" I shot a glare over the breakfast bar in her mother's - my sister's - direction, but she quickly pretended to be loading her dishwasher, conveniently disappearing from view. I loved every part of working on this book, and not just because of Madelyn's brilliant mind and wonderful writing style. 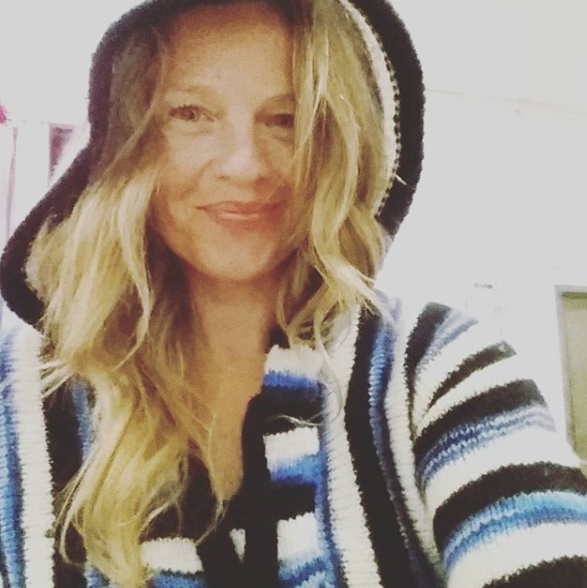 I also loved it because Julia came into my life at a moment when I was looking hard at how I was spending my time, now made more expensive by becoming a mother, and my own work, wondering if I was living in a lifestyle or a lifestyle brand. Feeling like maybe the perfect scenes I was seeing (and, OK, placing) in social media weren't maybe making our lives harder somehow. If blogs and lifestyle brands and exposure were really adding value to my life, or pulling me away from it, into a virtual world of illusion that made me want more things, want more perfection, more beautiful vignettes. 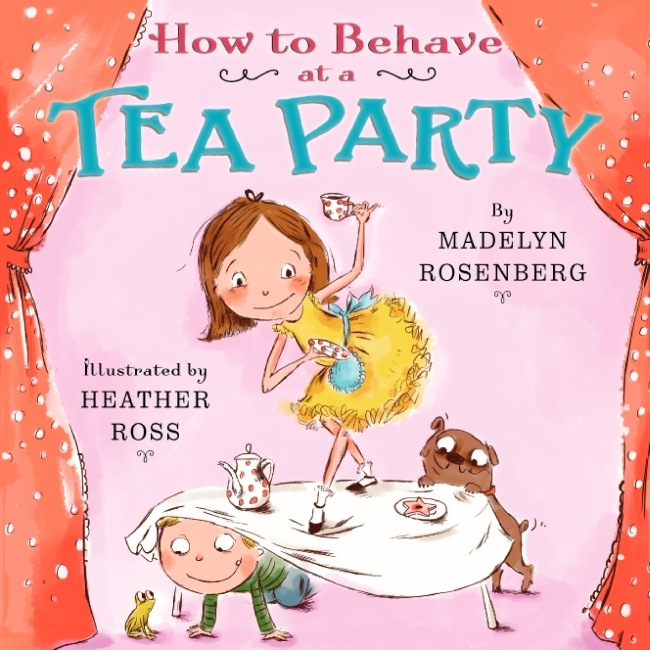 I thought, while sketching the illustrations in this book, about the tea party I had thrown for my one year old daughter, for twenty eight mostly adult guests, on linens and fine china, styled, sometimes forced, and photographed to the umpteenth degree. Around the time I wrapped up this book I made a new rule in my own life. I would say yes to the work that meant more time actually drawing and writing, regardless of pay. I would say no to anyone who expected me to accept "brand exposure" as a form of compensation for my time or my work. And because these two points would mean that my job would involve a lot of hours working in isolation, I would develop my teaching events into celebrations of the handmade community, which is full of people that I love and respect, and am inspired by. And, most importantly, I would try to hard to not compare (and compete with) my life to perfectly styled scenes, and that when I had the urge, as I do every time something good happens, to take over the scene and manipulate it's composition to make a good picture, I would instead try, as my daugher now likes to say, to "put my phone back in my pocket." And then, OK, I did throw another crazy fancy party for Bee, on her 2nd birthday. But this time I didn't mind so much when things were spilled or broken, and I put out the good china for the toddlers, and I ecouraged every kid in our neighborhood to come, which they did, fresh from the gravel roads with their little dirt bikes, piled up in a crazy heap with their tires still spinning, in my driveway as though they were left by a biker gang who had just run into a bar for a fight. I didn't even freak out when they moved the party upstairs, moving like a swarm of yelling locusts up the steps and bursting through the hinges on the safety gate with it's sticky latch and leaving it lying on it's side, looking relieved. We ate piles of cake and didn't look at our watches, naps were skipped and the dog ate a lot of things that he shouldn't have, and we did have some very pretty moments, of which we did take pictures, but this time they were of moments that were actually happening on their own. small steps, I hope, towards really mastering the art of knowing How to Behave at a Tea Party.